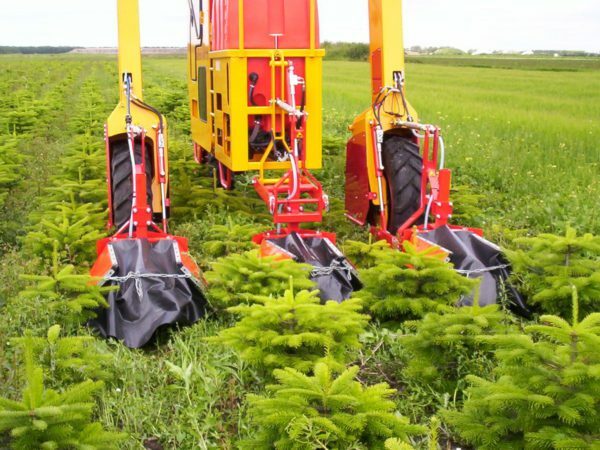 These spray hoods are mainly used in Christmas tree cultures, but they are also very suitable for other crops. 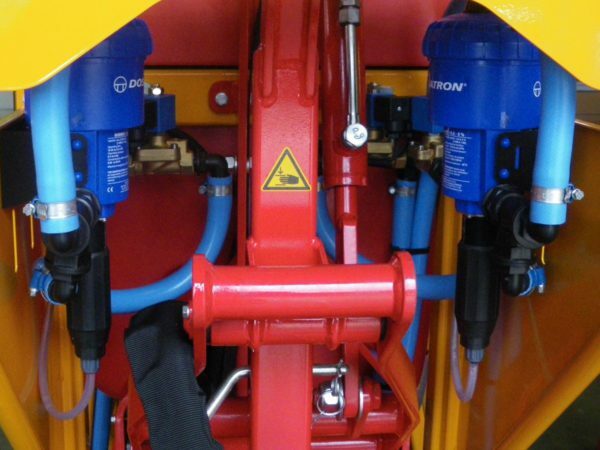 Our sprayer is always provided with 3 spray hoods, one in the middle at the back or bottom side of the sprayer and one hood behind each wheel of the high clearance tractor. Our basic spray hood is available for row distances between 90 and 120 cm, the width is adjustable through a chain. It is no problem if you always want to use the spray hood on its full width. When touching a tree with one of the hoods it will easily fold in and afterwards it folds out again. This causes the best spraying results. The 4-rows spraying frame processes, like the name already suggests, 4 rows at once. The frame is provided with 5 spray hoods; 3 completes hoods and 2 half hoods for the outer rows. 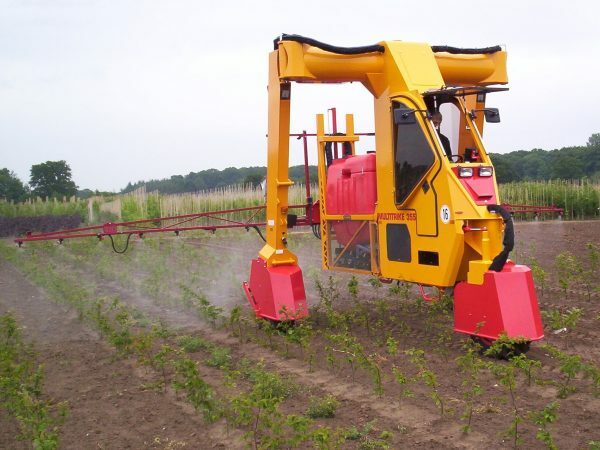 The vertical spray bars are deliverable as an extension to the above mentioned 4-rows spraying frame. They can also be delivered separately as a three-points mounted attachment. When provided with this extension the 4-rows spray bar it both able to do weed control and crop protection. The horizontal spray bars are available in two lengths; 10 and 12 meter. The sprayer has to be provided with a height adjustable lifting device to be able to bring the spray bar in the right spraying position. We can basically mount an adjustable lifting device of 60, 100 and 150 cm (other devices are available on demand). An external dosing pump can be mounted to keep the sprayer always clean. Using a Dosatron dosing pump means no chemicals in the tank anymore. So you can easily keep it clean. 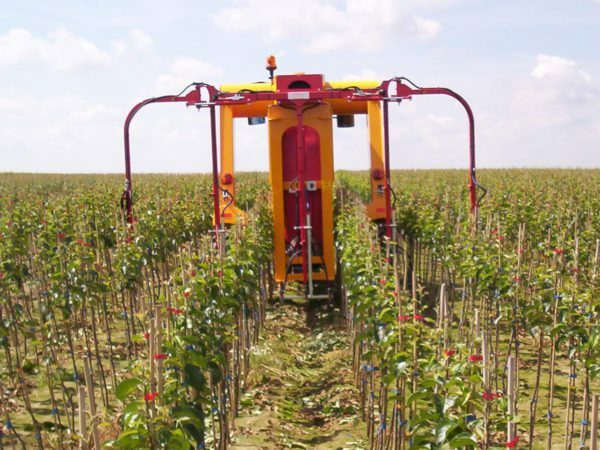 Our sprayer can be provided with 1 or 2 Dosatron units. Another choice our customers can make is if the Dosatron units have to be able to be switched off separately. 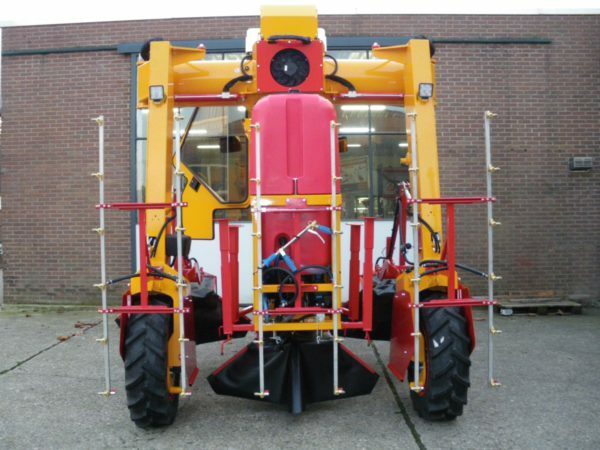 Damcon is producer of the high clearance tractor Multitrike. Our high clearance tractors are suitable for row distances between 90 and 150 cm (a.o. Christmas trees, fruit trees and conifers). Visit our website www.damcon.com for more info about what we have to offer.